The main critical uncertainty related to the American move is first the level of this commitment and then its consistency over time. As a result the survival of the Syrian autonomous region, the Kurdish-led Federation of Northern Syria has also become more uncertain. The outcome in terms of American regional and global influence is also uncertain. Rising global tensions, notably with the U.S. on the one hand, Russia, China, Turkey, and Iran on the other. As the news regarding the creation of a 30000-strong U.S. backed Kurdish-led SDF Syrian border forces spread, Turkey, unsurprisingly voiced its strong disapproval, threatening again to attack the Kurdish enclave of Afrin. The Bashar al-Assad regime similarly reacted strongly, seeing this move as a threat to its sovereignty, and a foreign invasion. As a result, it is likely that Russian efforts to (strongly) promote a Federal Syria, where the autonomous Federation of Northern Syria, with its strong Kurdish component could survive, is being undermined. It is also likely that it will be much harder for Russia to assuage Turkey’s fears. As a result, the fate of the multi-ethnic polity remains uncertain. It will now depend upon both the seriousness of the U.S. commitment, as well as the capability of the Russian peace initiative, with the planned Sochi congress approaching, to survive the American move. Meanwhile, the impact of the move on the American influence is also uncertain. Should the U.S. finally only provide inconsistent or lukewarm support to the SDF, the consequences could well be negative. On the other hand, should the U.S. remain committed to the Kurds and tension continue to escalate, then the U.S. could be dragged into yet another war, with a strong regional component. Furthermore, Russia could increasingly be seen as a peace-maker and the U.S. as a war monger, as indeed immediately emphasised by Russian Foreign Minister Lavrov. Tensions, regionally and globally, have escalated again. The U.S.-led Coalition against Islamic State is currently training a force to maintain security along the Syrian border as the operation against ISIS shifts focus. 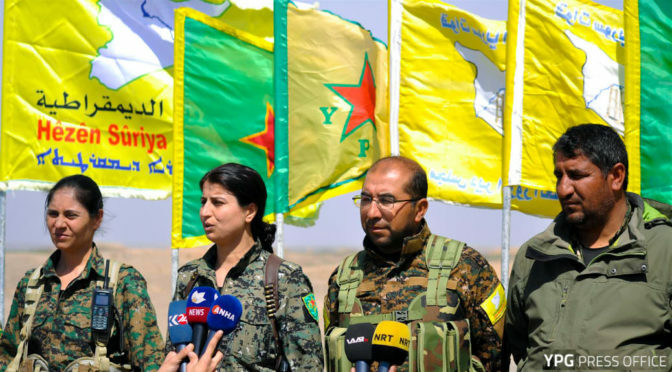 The 30,000-strong force will be partly composed of veteran fighters and operate under the leadership of the Syrian Democratic Forces, CJTF-OIR told The Defense Post. By Levent Tok and Mohamad Misto RAQQAH/ ISTANBUL The PKK/PYD terrorist organization is allegedly getting prepared to establish a regular army, local sources told Anadolu Agency. The so-called “border guards”, trained by the U.S. through the Pentagon and the CIA, have formed what they call “The North Army”, said the sources, who spoke on condition of anonymity due to security concerns. BEIRUT/MOSCOW (Reuters) – Syria, Turkey and Russia responded vehemently on Monday to new U.S.-backed plans to set up a 30,000-strong “border force” inside Syria to protect territory held by Washington’s mainly Kurdish allies. The Syrian government vowed to drive the U.S. presence from the country. Turkey, an increasingly estranged U.S.
CAIRO (Sputnik) – The creation of the so-called Border Security Force (BSF) on the Syrian territory controlled by the Kurdish-led Syrian Democratic Forces (SDF) may lead to separation of several regions from the territory of the Syrian state, a member of the opposition’s delegation to the Astana talks told Sputnik. The Syrian Foreign Ministry has slammed Washington’s intention to form a 30,000-strong force inside the country with the proclaimed goal of maintaining security along its borders. The Syrian Army is poised to put an end to any form of US presence in the country, a Syrian foreign ministry source said, according to state TV. By Joshua Landis January 15, 2018 The State Department has turned the page on Turkey for it no longer views Ankara is a reliable US partner. Many argue that Washington will abandon Syria’s Kurds in order to assuage Turkish anger. I doubt this. Washington expects more anti-US actions from Erdogan.